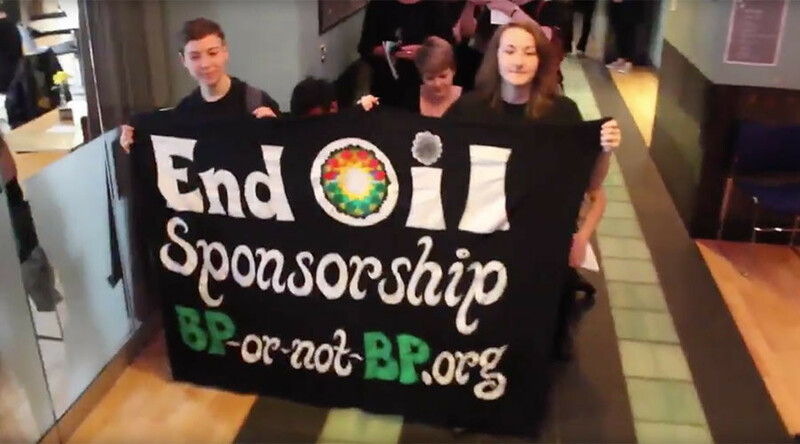 The Edinburgh International Festival (EIF) has dropped BP after 34 years of sponsorship following claims by campaigners that the energy giant’s environmentally harmful practices are being legitimized through cultural events. EIF, one of the world’s biggest arts and culture festivals, confirmed via social media that it had ended its relationship with BP. “The EIF has walked away from a 34-year partnership because being associated with BP was doing too much damage to its reputation,” Jess Worth from ‘BP or not BP?’ – a theatrical campaign group that has routinely staged creative protests against BP’s sponsorship of the arts – said. Environmentalists, academics and artists joined in last year’s protests. Last summer climate activists held a 25-hour protest in the Turbine Hall of the Tate Modern, writing charcoal messages on the floor after a standoff with museum officials. In November, the Liberate Tate campaigners occupied Tate Britain, where they tattooed their skin with the levels of carbon dioxide in the atmosphere during the year of their birth. Arts sponsorship is possibly the least of BP’s worries at the moment, however. In a legal challenge across the Atlantic, a US federal judge ordered the oil company to shell out an additional $20 billion to resolve nearly all of the claims associated with the 2010 Gulf of Mexico spill, one of the largest manmade environmental disasters in history. The settlement, which was first announced in July, adds on to the $43.8 billion in fees for criminal and civil penalties and cleanup costs BP had already incurred.